The title may sound like a tongue twister, but that’s how my second full day in Washington progressed as I continued to enjoy tasting my way around the state. 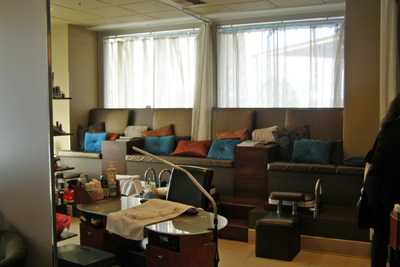 After the tour, I headed down to the spa for my Mimosa Manicure & Pedicure. Though we had to do a bit of an alteration to the theme (since I have a citrus allergy), I thoroughly enjoy the hand and foot pampering with a glass of sparkling wine in hand. It was the kind of indulgence I never do at home and, actually, I don’t think I ever sit still for that long anywhere without a computer or IPhone in front of me! My trusted driver from British Motor Coach picked me up for the 15 minute ride to Willows Lodge in Woodinville. I could tell instantly that this was the place comfort was made from and the large fireplace and woodsy look helped to enforce that. I couldn’t get comfortable for too long, though, because Rhanda Rosselot came to give me a tour of the property. 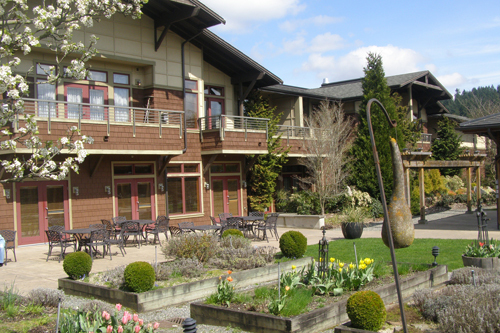 I enjoyed the décor inside and out at Willows Lodge. We went through The Herb Farm restaurant and – after seeing the beautiful table settings and impressive wine collection – I wished I could stay an extra day to eat there. I also stopped short at the garden for a moment of déjà vu. It all made sense when it was explained that Bardessono – one of my favorite hotels – was a sister property and this garden was replicated there. 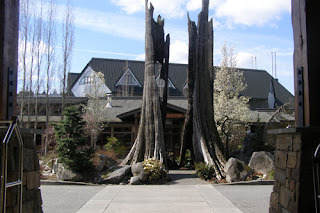 I would have a chance to sample some of the garden later in the night during my dinner at the Barking Frog, but first I had to go check out some wine! Cynthia Daste, Executive Director of Woodinville Wine Country, picked me up to show me around town. 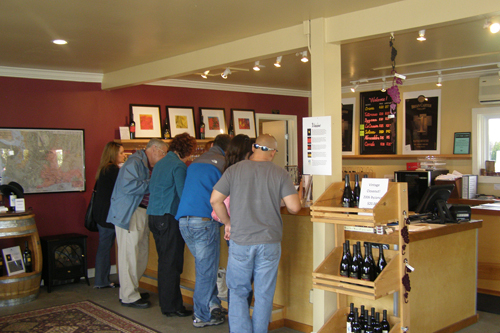 It’s not really a place filled with wineries and vineyards, but more the home of tasting rooms from wineries around Washington, over 80 in all. 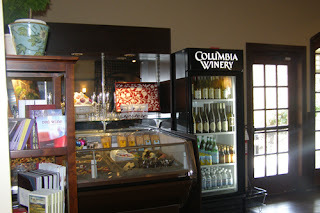 We did go first to one of the few that have it all, Columbia Winery. 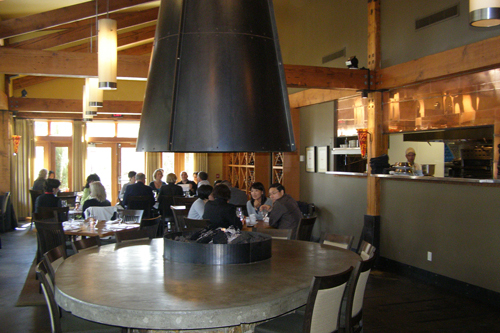 The tasting room is in a large building that also houses rooms for events, a large shop and a wood-burning oven, from which I had a delicious Spring Asparagus Flat Bread. I enjoyed quite a few of the Columbia Wines, especially the 2009 Cellar Master’s Riesling with its pineapple and peach, and the Rose, an unusual one made of Petit Verdot, which was very fruity without being too sweet. We made a quick stop at Dusted Valley (I will save that info for later in the week when I have my dinner in Walla Walla with owners Chad and Corey), before we headed to Brian Carter Cellars. While I really liked the 2009 Oriana (55% viognier, 29% roussanne, 16% riesling, with fruit and floral), I was extremely excited about the 2008 Abracadabra. This blend is different each year and contained 10 wines in ’08. It’s named for the “magic at the end of the vintage” and it had enough magic to satisfy this woman who favors whites. 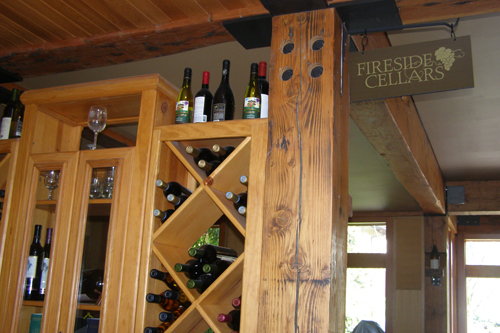 Willows Lodge's Fireside Cellars. I enjoyed some great music and a Page Sauvignon Blanc before my hosts arrived. It would turn out to be quite an evening at the Barking Frog as Restaurant & Wine Managers Matt Davis and Jennifer Schmitt, as well as Chefs Bobby Moore and Matt Kelley, would take turns sitting with me between courses. I started with a cocktail, the Spring Thistle Martinez that was made with Voyager Gin, Cardamaro, and Spiced Orange Bitters. It worked well with an excellent Seared Fois Gras, but I was fine with giving it up for a spectacular 2009 Chateau St. Michelle & Dr. Loosen Eroica Riesling. Soon I had a great Roasted Heirloom Beet Salad with goat cheese and hazelnuts in a vanilla honey drizzle in front of me and was wondering why I ever said I didn’t like beets. It blended with the fresh Sourdough Bread garnished with Sundried Tomato Pesto that waiter Brian (who has been at the Barking Frog for nine years) brought me. Brian arrived with an English Pea and Shitake Risotto Pistou and a Warm Watercress Leek Salad, and before I knew it there was another glass of wine in front of me, this time a 2005 Tranche Barbera, a red on the milder side that I preferred to the peppery next one, 2008 DeLille Doyenne AIX. I cleansed the palette with some Coconut Sorbet with Pineapple and then ate what I could of the Muscovy Duck with Smashed Fingerling Potatoes and Fois Gras Huckleberry Demi Glaze, followed by a tasty Sous Vide Tenderloin on top of Egg Yolk Ravioli, with Caponata. As much as I love chocolate – and the Dark Chocolate Valhrona Tart with Cinnamon Chantilly was the perfect dessert specimen – there wasn’t too much room left in me for that or the just sweet enough 2003 DiStefano St John Dessert Wine, a semillon, sauvignon blanc blend. 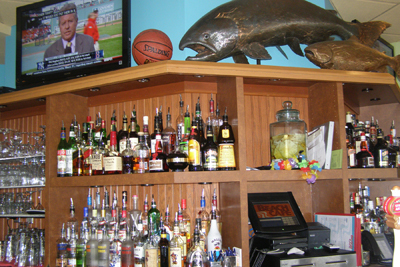 I left the restaurant feeling totally stuffed to the brim with excellent gourmet food (and impeccable service). When I returned to my room at Willows Lodge I had a surprise waiting for me – a bubble bath in the large soaking tub! I couldn’t have asked for more on a long day and it helped me relax and settle in for the night before my morning flight to the next area of Washington wine country – Yakima.